Whenever I pick up a Susan May Warren book, I know to also grab a box of tissue for my tears and to make certain I’m somewhere I can laugh out loud. 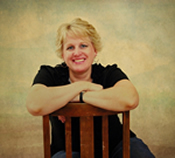 Susan doesn’t use mere words to tell her stories, she uses pure, undistilled emotion. Baby It’s Cold Outside, is no exception. I was hooked from the first sentence and didn’t stop reading until the final period on the last page. Baby It’s Cold Outside is going on my keeper shelf. I expect I will make a yearly pilgrimage to Frost, Minnesota and spend the 1949 Christmas holidays stranded in Dottie Morgan’s quaint Victorian house with her and her four reluctant visitors as they learn how powerful love and forgiveness can be. I highly recommend this book. In fact, if you’ve read my other reviews you know that I highly recommend any and all Susan May Warren books. 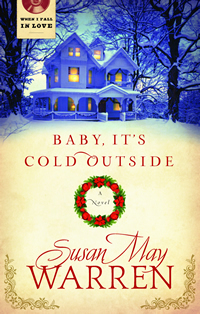 Warm up to Chrismtas early this year with Susan May Warren’s, Baby It’s Cold Outside! Warm up with a Kindle Fire from Susan May Warren! To celebrate the release of her new Christmas book with Summerside Press, she and the publisher are giving away a Kindle Fire and hosting an early Christmas Party on Facebook! But, wait there’s more! Join Susan May Warren on 10/27 for merriment and a few early Christmas presents at her Baby, It’s Cold Outside Christmas party! Grab your Christmas sweaters, socks and pj’s and join Susan and a few friends for a fireside chat about her recent books (Heiress & Baby, It’s Cold Outside), holiday traditions, favorite Christmas recipes, a trivia contest and more! Invite your friends and don’t miss the fun! RSVP here and we’ll see you on October 27th at 5 PM PST / 8 PM EST! Today’s my day to post on this too. Absolutely loved it! Linda — I have yet to read a Susan May Warren book I haven’t loved. The book sounds like a good read. Thanks, Quilly! Karen — ALL of Susan May Warren’s books are great reads. Sounds like a good one. I wish they’d do these giveaways not on FB or Twitter, though, but I know that’s easy and free advertising.